The new film Gravity has rightly garnered a great deal of praise for its spectacular special effects and for Sandra Bullock's gripping portrayal of ill-fated Mission Specialist, Dr. Ryan Stone. The movie has also become the target of much techno-grumbling in the nerdosphere over it's dubious premise, liberties taken with orbital mechanics and for the portrayal of cumbersome and complex space hardware as convenient, comfortable and easy to operate. For an interesting, balanced look at the film, by someone who has been there, see Astronaut Michael Lopez-Algeria's review. Personally, we were less annoyed than Neil deGrasse Tyson with the liberties taken by Gravity in getting fast and loose with science. What bothered us most was having it set set in some alternate universe of economics. Great execution has long excused storylines that warp the reality of time and space and we found Gravity a magnificent, guilty pleasure. Bullock's flitting between conveniently placed space outposts was necessary to the film's plot and the intrinsic problem with that seemed to elude nearly everyone in the theater. However, the artifice that everyone did notice was an entirely unnecessary addition to the film: a space shuttle -- the destruction of which, maroons Bullock in space. We suspect the decision to transport the American astronauts in a shuttle was based on the theory that familiarity supports believability. Everyone knows and admires the beautiful lines of the shuttle, but we also know that our shuttle fleet is entirely safe, because the walls of museums protect these venerable craft from space debris. The manufacturing lines and the supply chain necessary to build shuttles have been shut down for years. It would be easier to bend the laws of physics and place the ISS and the Hubble Space Telescope into the same orbital neighborhood than it would be to fund the construction and operation of another space shuttle in today's United States! Budget overruns and delays have already forced NASA to abandon Constellation, its first shuttle replacement, and the agency is currently pushing a less ambitious exploration project known as the Space Launch System (SLS). With the government flipping ever more rapidly from sequestration, to shut down, to the brink of default, it has become increasingly difficult for anyone to believe any traditional, government run space program can be funded to completion. So, we were not surprised that director Alfonso Cuarón chose not to use the government's Orion capsule in his film. However, Cuarón might have maintained Gravity's sense of realism and captured relevance by flying our heroine to orbit in one of America's new commercial spacecraft. 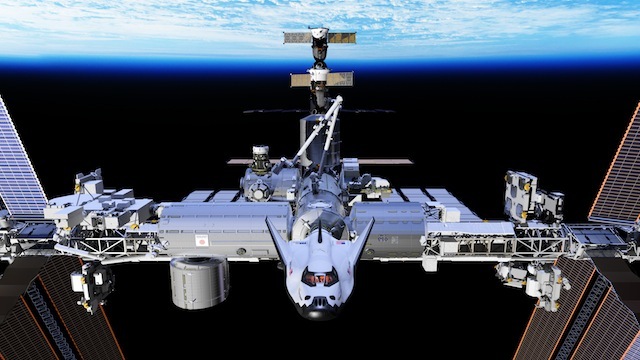 A SpaceX Dragon capsule, Boeing CST-100 or Sierra Nevada Dream Chaser space plane would have offered an exciting and modern space transportation choice. While private spacecraft might sound like science fiction to some, these vehicles, along with their proven launch systems, the SpaceX Falcon 9 and United Launch Alliance Atlas V, are very real solutions currently undergoing NASA certification and testing in preparation for manned flights in the next few years. Orbital Sciences has recently demonstrated that their Antares rocket is fully ISS capable launch system and it could potentially be paired with any number of commercial orbiters underdevelopment. The innovation and efficiencies created by a competitive free marketplace are already driving a renaissance in spaceflight that will sweep aside the film's clunky Soviet era Soyuz and the Chinese knockoff, Shenzhou. We hope that millions enjoy Gravity and are inspired by its compelling imagery of humans at work in Earth orbit. It would have been great if it presented a more realistic way of how Americans are, in fact, going to be doing that. We look forward to seeing Bullock relaxing on a safe, commercial flight to a commercial Bigelow space habitat in Gravity 2. Greg Autry, is an adjunct professor with the Lloyd Greif Center for Entrepreneurial Studies at the Marshall School of Business, USC. He studies New Space firms and is currently working on a report for the FAA on National Competitive Advantage in Human Spaceflight. This article was written with Laura Huang, an assistant professor of management and entrepreneurship at the Wharton School, University of Pennsylvania.